Spotted at the Frankford Transportation Center earlier this month. The Trolleys will be replacing the remaining 40 older Neoplan buses which did not have bike racks. 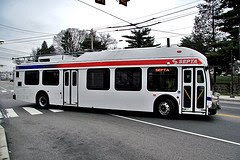 We can comfortably say that once the delivery is complete that SEPTA buses and trackless trolleys will be 99% bike accessible.